Here’s a quick rundown of the bullish and bearish for the week ahead and beyond. Except for ongoing stimulus(for fundamentals, “the one thing to rule them all”), which is no small thing and bullish for the pair, what other fundamentals are in the EURUSD’s favor? However that might change this week. As we discuss here, in the coming week’s it’s more likely that the ECB makes the next dovish moves while the Fed simply maintains its current QE 3. Indeed, this week’s ECB rate statement and press conference could well reveal that the ECB is moving towards concrete easing steps, which would weaken the EUR and hence be bearish for the pair. Most of the developed world economies continue to struggle, so most economic data tends to be bearish for this pair, which tends to move up with good news and down with bad news. Ongoing political uncertainty in both of these TBTF nations continues to be THE primary bearish market mover for the pair. Neither is likely to improve in the coming week. So far markets remain unconcerned about the coming automatic budget cuts, essentially because they understand any deal is likely to be late and no serious damage will occur for at least another month, as we discussed in our review of coming week market movers here. While the most recent leading indicators of the coming report (weekly first time jobless claims data has beaten expectations, as did the Chicago PMI) suggest they’ll continue to show a slightly improving US jobs picture, it’s too early to make any meaningful prediction. As this week progresses we’ll see more of these reports, like ADP’s version of the official NFP report, as well as the ISM non-manufacturing PMI (its jobs component is one of the more accurate leading indicators of the official report). How this report influences the pair depends on whether it raises hopes for earlier than expected US interest rate increases. If it does, which only happens when it strongly beats expectations enough to suspect it might make the Fed more optimistic about US growth, then it’s bullish for the USD and hence bearish for the pair. If it makes the opposite impression, it’s bullish for the pair. Given that few expect it will do anything that would alter the Fed’s current commitment to QE 3 for the foreseeable future, the most likely outcome is that the report has little effect on the pair. As the most widely traded pair and the one pair comprised of the two most widely held major currencies, when considering the technical picture for the pair, one must look at both charts that represent overall risk appetite like the S&P 500, as well as the chart in the same time frames of the pair itself. As we noted in greater detail here, the technical picture for overall risk appetite as represented by the weekly S&P 500 index is mixed. The index has been flat for 3 weeks and the long uptrend is due for a normal correction. That impression is reinforced by the fact that both of the past 2 weekly candles have been dojis, which suggest indecision, and after such a long uptrend, are likely to signal some kind of reversal. As we’ve noted repeatedly, (for example here) the index remains near decade highs and decade-old resistance that could not be broken even when markets had the support of conventional fundamentals (a bright outlook for growth, jobs, spending). Now they don’t even have that. Stimulus has gotten risk appetite this far up from its March 2009 lows. Can central bank intervention alone power risk assets like the S&P 500 to new all time highs? Even if it does, can it provide enough lift for a sustained move higher? The one big caveat is that the uptrend’s momentum is very entrenched, so expect risk appetite won’t give up so quickly. Political uncertainty in Spain, and particularly Italy, has been the prime catalyst for profit taking in February that erased January’s gains. 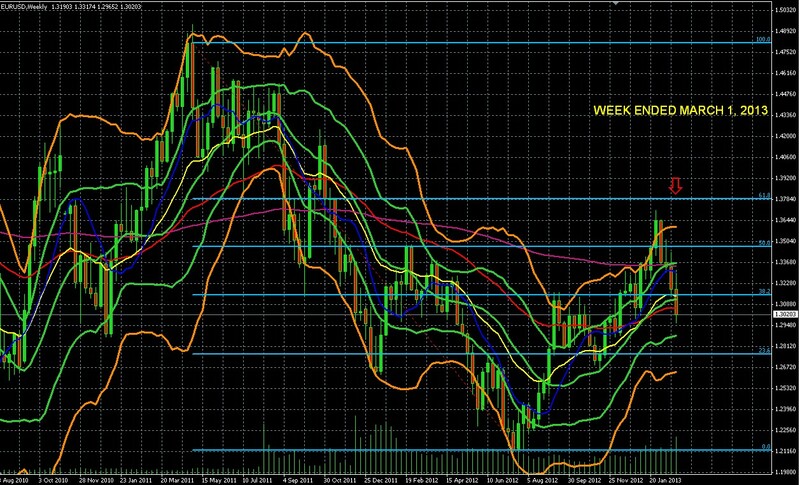 Consider the weekly EURUSD chart below. If it breaks below this level, there is little meaningful support until the area around 1.2800, where the 23.6% fib retracement line provides support not far below that around 1.2750. Considering the dour fundamental picture noted above (see here for more on that), the odds favor a continued move down over the coming week and beyond barring some significant surprise. Regular readers will note I’m repeating myself, however I’ll keep it up because no one else seems to be sounding the alarm and we’re adrift in a sea of complacency about the risks the EUR and USD. The Fed is already actively engaged in policies that should devalue the USD over time, and that the ECB will need to do likewise to have any chance of holding the EU together while keeping the weakest members liquid and at least technically solvent, both the EUR and USD are not the best currencies in which to have most of your wealth. Those who are based in the USD have suffered a steady wealth drain for decades. Remember cheap Japanese cars? Europe on $5/day? See here for further details on how the USD had been steadily shrinking long BEFORE we started with QE 1-3.